Political editor Dr Martin Hirst has been musing on recent political news while re-reading Thomas Hobbes’ Leviathan. His outlook is bleak. First published on Independent Australia 2 June 2018. I’m doing a course at my local TAFE this year; it’s a mixed group. I’m one of three oldies (I’d describe myself as a late baby boomer). Apart from a couple of students in their mid 20s, the rest of the group are all in their late teens. We had a discussion this week about what constitutes the zeitgeist — the “spirit of the Age”. Some of the responses from the millennials in the class got me thinking. In part, I reflected on what I was like when I was 18; I also began to think about Thomas Hobbes and those famous lines from Leviathan about war of “all against all” and the bleak lives – “nasty brutish and short” – that some of us are forced to live. I was reminded of these passages – from Chapter XIII, ‘Of the natural condition of mankind’ – by some of the fears and concerns expressed by millennial classmates. For them, the overwhelming zeitgeist is fear. They are scared about the future that is facing them. More importantly, perhaps, they feel powerless to do anything about it. They talked about how difficult it is for them to find work — even the precarious work of casual shifts in the hospitality or retail industries. They talked about feeling like they’d never be able to afford to buy a house, and their fear of global warming and the damage that we’re doing to the planet. But most of all, they felt like they could do nothing about the problems confronting them. I thought about it for a few days afterwards. Something was niggling me. I finally figured it out. For many millennials, it feels like they are being deliberately excluded from society and from decision-making. Then it hit me: our whole political culture is built on exclusion and fear. It is actually blindingly obvious. Malcolm Turnbull is a Scorpio. 2017 could be a year of failure and disappointment for the invisible Prime Minister. Can #Fizza Turnbull make it to the end of the year? The signs are not good for PM Malcolm Turnbull as 2017 slowly recovers from its Christmas hang-over and bingeing. Already the advance guard for the Trump faction of the Coalition is out and about wining and dining and whining with the ready-made racists of the notorious anti-Muslim Q Society. Cory Bernardi and George Christensen accepted invitations to speak at a Q Society fundraiser months ago, but over the slow-news holiday period a couple of lazy journalists thought they’d revive the story, you know just for the lulz. Like most such stories, it first got a run in The Australian over a month ago, where it was treated as good news about mates helping a friend who happens to be an anti-Islam bigot. According to The Oz’ Chip le Grand, Bernardi and Christensen are stepping up to help the Q Society and three office-bearers to fund a defamation defence. [S]elf-styled conservative warriors Cory Bernardi and George Christensen will ­appear at a fundraising dinner to help an anti-Islam organisation and three members of a rival ­political party defend themselves in defamation ­proceedings. Why The Guardian decided that the first day of the new year was a perfect time to publish their own take on this story is a mystery to me. Perhaps it really is the silly season and the editor hoped that we’d forget that we’d actually seen this story somewhere else some time ago. However, in a textbook case of cascading media coverage, once The Guardian story appeared on 1 January it was repeated (with only minor amendments) for the next 48 hours across Fairfax papers (3 January), on Sky news (3 January) and on the News.com.au website (3 January). 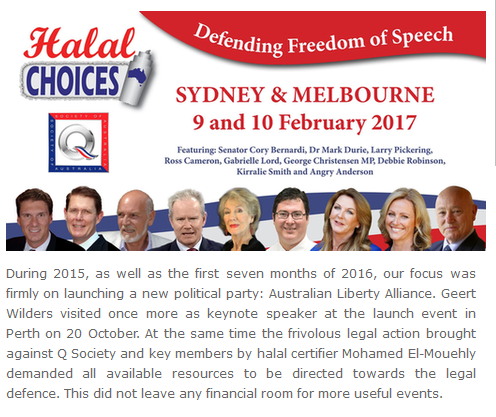 The simple summary of the story is that three leading members of ‘Australia’s premier Muslim-critical organisation’ are being sued by Mohammed El-Mouelhy, the head of the Halal Certification Authority. El Mouelhy claims he was defamed in two videos produced by the Q Society. The case is being heard in the NSW Supreme Court and has been running now for nearly 12 months. It is estimated that the Q Society will run up over one million dollars in legal costs to defend itself and its members. But this is not a piece about these idiot bigots, it is about Turnbull being wedged on the Islamophobia issue for the benefit of the right wing nut jobs who want to take over the party. So far the bigots and nutjobs are hiding in plain sight, under the umbrella of Bernardi’s Conservative Leadership Foundation which is the vehicle for his right-wing, Christian, small government and free enterprise values. His natural allies are the likes of the Q Society, which (coincidentally) has its own political ‘party brand’, the Australian Liberty Alliance. You can read the original version of this piece at Independent Australia. Malcolm v Gough: Who is/was Australia’s worst Prime Minister? It has been a stable myth of Australian politics for nearly half a century, but was the Whitlam government of 1972-1975 the “worst” in Australian history? I don’t think so and believe we can now safely make the claim that Whitlam’s record of so-called disaster is about to be overshadowed by the ongoing disaster that the Abbott-Turnbull government appears to be. Perhaps we might even be so bold as to suggest that Turnbull’s legacy will be his ham-fisted attempts to dismantle some of the major reforms of the Whitlam period. Was Whitlam really “that bad”? 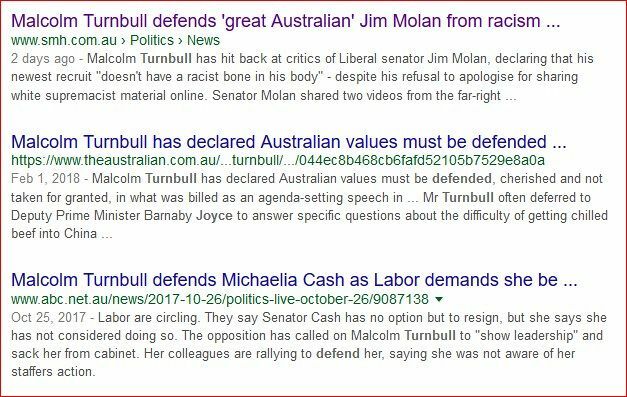 All the aging so-called “superstars” of Australian political journalism would agree that Whitlam’s crash or crash through demeanour was at times rash or ill-considered. They would also chime in that Whitlam’s cabinet was the most incompetent of all time. Laurie Oakes, Paul Kelly and several others have written books on the Whitlam government and its dismissal that paint a picture of disaster and ill-considerd policy. They would point to the Khemlani loans affair, Jim Cairns’ sexual affair with Juni Morosi, the debacle of some economic policies and a general air of chaos, then they would claim that Whitlam and the ALP were out of their depth, not ready to govern and lacking in individual talent or vision. They would argue that Whitlam’s dismissal by the governor-general was justified. It wasn’t really until Whitlam’s death that the achievements of his government were properly acknowledged and celebrated. So, finally, in 2015 Australia the debate about human rights has become politicised. It’s about time really, human rights should be a very political question. You know, discussing the politics of who does and who does not support universal human rights should be regular dinner time conversation in most normal families, or pub chatter for the more inebriated among us. In any civilised country, one that prides itself on taking human rights seriously, the application or removal of those rights should be a matter of political discourse and close attention. Which, sadly, leads me to surmise that Australia today is losing some of its civility. Our ability to have a sensible and sensitive conversation about the importance of human rights and to debate the failures (or the rare successes) of our government (of any stripe) in promoting human rights seems to be diminishing. Instead the media thugs and government bullies are out to silence one of the last bastions of criticism of Australia’s uncivil and inhumane refugee policies and to shut down debate about the steady erosion of our rights through the over-reach of surveillance and through the fear-mongering around terrorism.